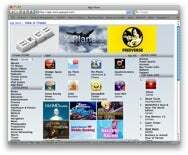 In what is most likely a well-meaning attempt to remix the Apple App Store sans iTunes, ReadWriteWeb points out that an enterprising developer has made the App Store available via any web browser. The site, app-store.appspot.com, is hosted on Google's App Engine, and was created by scraping Apple's XML from the iTunes store and then converting it to plain vanilla HTML. Of course, there are already other sites, like AppBeacon, that take a similar approach. In a comment on the ReadWriteWeb post, AppBeacon creator Justin Noel writes: "There are many sites, including ours, that scrape content from the App Store and present it to our users. I don't believe Apple minds, as they actually approve us for the affiliate program manually. If they had a problem with us, then they would just refuse to let us get paid." While Noel's point is true, it would seem to me that app-store.appspot.com is essentially an exact replica, layout and all, of the iTunes store—which Apple might have a problem with. After all, they've gone aftersites like ModMyiPhone.com , forcing it to change its name to ModMyiFone.com and later to Modmyi.com. I'm guessing that Cooperman's not going to like this one either.